A Voice Is Heard was founded during a period of extreme drought that plagued Kenya in 2009. The drought, the worst in living memory, caused devastation of wildlife herds; populations of zebra, wildebeest, and buffalo were reduced to historical lows. The human toll was likewise staggering: hundreds of thousands fled the drought to take refuge in neighboring countries, while the millions who stayed at home were on the brink of starvation. Families were disrupted as herders were forced to move with their livestock in search of forage, and women and children were left behind in the villages without food or water. When A Voice Is Heard arrived in Amboseli during the drought, we found malnourished mothers holding starving babies and livestock carcasses scattered in the dirt surrounding the villages. Emergency aid was nowhere to be seen. With the help of our donors, we gave over 3,000 families emergency food aid, distributing more than 16 tons of maize, 8 tons of beans, and 2 tons of oil. These emergency measures were only a temporary solution; today we are creating long-term strategies to address food and water insecurity through sustainable agricultural practices. A Voice Is Heard raised funds to establish seed sharing projects for Maasai farmers living on the slopes of Mt. Kilimanjaro, to help increase agricultural production in the fertile areas and provide a greater measure of food security. With our investment, we provided 220 farmers enough maize and bean seeds to plant over an acre of crops. All participating farmers were required to share their first harvest with a neighboring farmer in need, creating a pay-it-forward program that has, after three years of harvest, provided seed for more than 600 farming families. In 2014, we plan to introduce our program and invest seeds in additional farming areas. The seed sharing programs create more than food security; a family with a surplus of food is better positioned to pay school fees for its children and invest in land and supplies for the future. Drought is a constant threat and a periodic, unavoidable reality in Amboseli. Emergency food aid can help sustain the Maasai through periods of drought, but aid is not a sustainable solution to the ongoing threat of crop failure or loss of livestock herds. The Maasai of Amboseli lost 80% of their goats to starvation and dehydration in the 2009 drought, resulting in the loss of a primary protein source as well as a loss of wealth. Soon after, A Voice Is Heard launched a goat herd building project that introduced a new breed of goat to the region. The Galla goat is a highly drought resistant breed that produces larger volumes of milk than the traditional local breed. We have distributed hundreds of Galla goats to herders throughout the region. 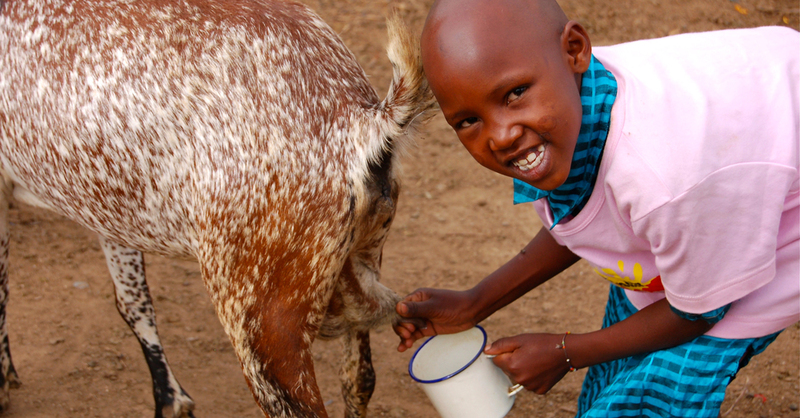 At the same time, we work with local veterinarians to educate herders on the care of the breed, emphasizing the importance of vaccination and drought preparedness. From our original goat investment, the population of Galla goats in the region has grown to thousands and continues to thrive. Growing a better future, one seed at a time.